Long seen as a luxury fixture, freestanding clawfoot bathtubs are a stunning centerpiece in any bathroom. Clawfoot tub designs typically feature cast iron and porcelain construction, but today they also can be made of fiberglass, acrylic or other lightweight modern materials. Clawfoot tubs have a striking appearance that hasn't changed much since they first became popular about two centuries ago. Clawfoot tubs come in several styles, the most common being the classic roll rim or roll top. A slipper tub is the most elegant of the clawfoot tubs, having one end raised and sloped for a more comfortable reclining position. Double slipper tubs have both ends raised. 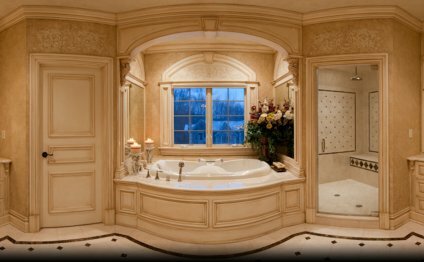 Pedestal tubs are a more modern take on the traditional clawfoot tub; instead of feet, the tub is placed on a pedestal. Clawfoot tubs can also be double-ended, which means both ends are rounded rather than one end being more flat or squared. Once you have selected the style of clawfoot tub you would like, you can then choose the type of feet and finishes. Chrome, polished brass, brushed nickel, antique bronze, or basic white or black are among your options for the foot style that will match other fixtures in your bathroom. You may want to purchase coasters for the feet as well, to protect your bathroom floor. You may also want to consider a wooden base rather than the feet; this can give you a warmer look that can be matched to your bathroom cabinets. You can select from a variety of clawfoot tub accessories and add-on items such as a reading rack or wine glass holder. Or add a tub caddy that fits over the rim for storing your shampoo, soaps and loofah. If you need the tub to do double duty as a shower, you can even add an enclosure with a riser pipe and curtain rod. One major advantage to choosing a clawfoot bathtub is its ease of installation. Unlike other tubs that have to be dropped in and caulked, a clawfoot tub is simply placed in the area of your bathroom that's set up for plumbing; no caulk necessary. Be sure you have enough space in your bathroom before purchasing a tub, as these units range from 60 to 72 inches long. Another advantage is that a clawfoot tub is styled for comfort. The contoured shape lets you recline comfortably in a tub that is deeper than many drop-in tubs. They are commonly made of materials that hold heat for a longer time—meaning you can relax longer.